"The Three Gorges Dam on the Yangtze River, China" by Le Grand Portage via Wikimedia Commons is licensed under the Creative Commons Attribution 2.0 Generic license. Although “dam fever” has come down in developed countries since the 1980s (Graf, 1999), the fever continues in developing countries (Grumbine and Pandit, 2013). By 2013, China had built 98,000 hydroelectric dams of various sizes compared with just 40 small ones up to the late-1940s (Yang and Lu, 2014). The hydropower plants contribute to reducing fossil-fuel consumption and associated air and environmental pollution and promote China’s economic growth. However, the dam alters the original hydraulic regime and consequently causes a series of environmental and ecological challenges in the region. 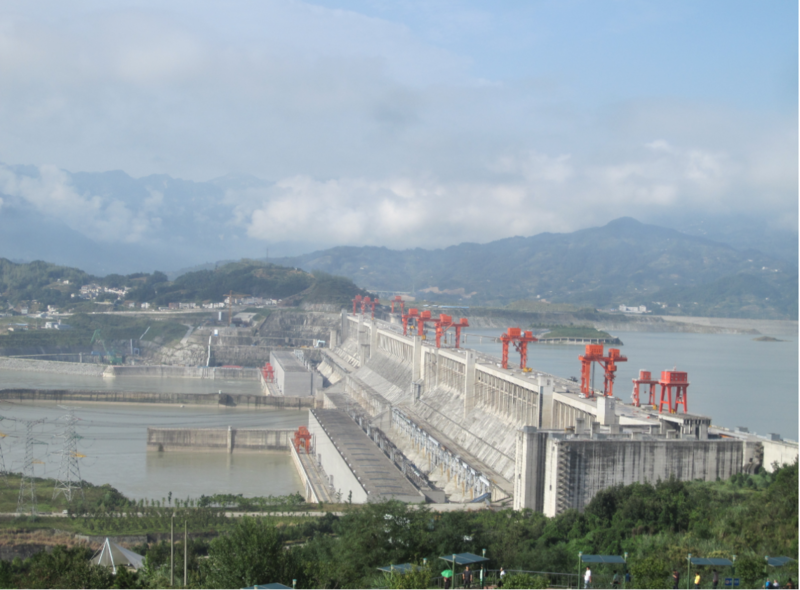 For the Three Gorges Dam, claimed as China’s as well as the world’s biggest dam and biggest power plant, one of the challenges is reservoir operation caused new riparian zones (Fig. 1). It has gained wide attention from public and government agencies because of the flooding magnificence and obvious landscape degradation. Its water levels are operated between 145m during summer and 175m above sea level (above sea level) during winter. This seasonally-flooded land has an area of 348.9 km2, most of which encompasses good alluvial soil and was previously used for agriculture (43.7%) and forest/grass (35.9%). Great opportunities exist to improve such riparian ecosystem by restoration of vegetation. But this should be based on deep understanding of current existing vegetation and key influential factors across different scales. Our study, therefore, sampled the main part of the mainstream and one of largest tributaries of the Yangtze River and examined riparian plant community composition and structure and their responses to surrounding landscapes, habitat quality, and reservoir management (three groups of influences) in the TGR. Based on quantitative ecology methods, we found 150 vascular plant species belonging to 130 genera of 56 families. Most species are annual herbaceous, confirming that our study area is severely disturbed and at an early succession stage. The low and medium-slop of the riparian zone have relatively fewer species while the high zone with more diverse species and community types. Overall, vegetation responses were very different across the analyzed scales. At the site-scale, landscape influence was most important in structuring communities. However, habitat (e.g. soil nitrogen, organic matter, etc.) and reservoir flooding (e.g. flood duration and frequency, etc.) influences have more impacts at the community-scale. Our study found a complex relationship between landscape, environment and riparian vegetation. These results would help ecosystem managers and policymakers to develop multi-scale and location-specific approaches in restoring riparian ecosystems. These findings are described in the article entitled Complex effects of landscape, habitat and reservoir operation on riparian vegetation across multiple scales in a human-dominated landscape, recently published in the journal Ecological Indicators (Ecological Indicators 94,1 (2018) 482-490). This work was conducted by Chundi Chen et al. from the Chinese Academy of Sciences. Graf, W. L. (1999). Dam nation: A geographic census of American dams and their large‐scale hydrologic impacts. Water resources research, 35(4), 1305-1311. Grumbine, R. E., Pandit, M. K. (2013). Threats from India’s Himalaya dams. Science, 339(6115), 36-37. Yang, X., Lu, X. (2014). Drastic change in China’s lakes and reservoirs over the past decades. Scientific Reports, 4, 6041-6041. Chundi, C., Maohua, M., Shengjun, W., Junsong, J., Yuncai, W. (2018). Complex effects of landscape, habitat and reservoir operation on riparian vegetation across multiple scales in a human-dominated landscape. Ecological Indicators, 94, 482-490.